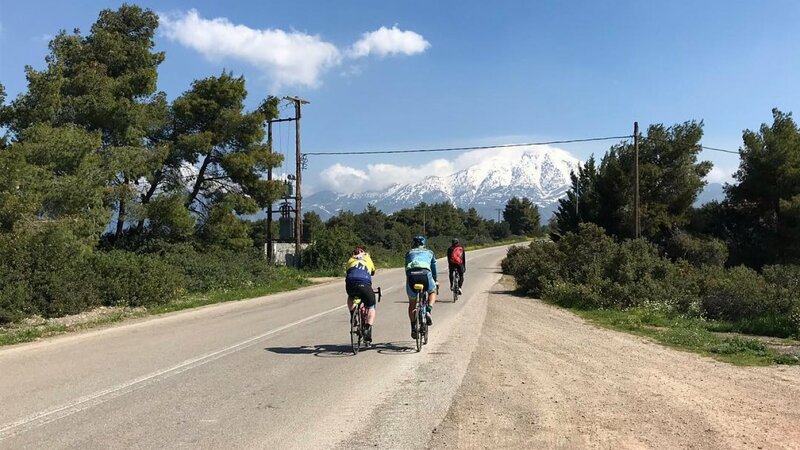 Bryan has recently returned from his training camp in Greece and writes about the unique opportunities for cyclists wishing to take their cycling to the next level. “For the last few years I have been looking to do a warm weather training camp, but I didn’t want to go to the same places everyone else goes and I when I went to NEC bike show last September I went with the goal of finding somewhere like this. At the show I met Paul and Steve at Greek Cycling Holidays which looked perfect for what I was looking for. They have a house in Eretria where they have been having cyclists for the last 3 years. Eretria is on an island around 1 hour’s drive from Athens airport and once you get onto the island (which is only a 100m bridge) you go into a different world. All the traffic stops, and life start to slows down. The house is located just off the main road around 1km from the town with a lovely port area with some great cafés. The house sleeps 8 people and is in its own gardens with a hot-tub where you can rest your tired legs after each ride. In the basement they have a full workshop and with a very good bike shop up the road they can keep you on the road in most situations. I feel the unique thing about this camp is it’s not a hotel and while you are there you feel you are very much at home. Steve has been a chef at some of the top restaurants in Europe and the biggest selling point is he cooks for you each day as well as join you on some rides. There isn’t any mass catered cooking but a menu to suit you and perfect for after a hard day in the saddle. Steve also makes his own jams and curds from the produce grown in the garden and he has even had the local winery make some wine from his grapes. One thing I didn’t expect was the roads in Greece after the trouble they have had over the last few years with their economy, but I was very surprise how good the roads were that we went on. On the island there is a main road that is about 500m from the house which runs the length of the island, which the local say is busy but to be honest it was like a UK B-road. Once you got off the main road then all you need to be careful of were goats on the roads (we got stuck behind a herd 3 times!). While we were there, we did a lot of climbing and most days we did over 3,000 feet but with very good road surfaces I was surprised at the end of each ride that we had done this much, and they were long climbs instead of short steep ones. Twice we rode from sea level to the snow line which was amazing, and we had some amazing views while going up and down. Each day we were able to go a different direction and apart from riding out each day for the first 30mins on the main road, each day we went a different way with each route looking and feeling very different. For details of next year’s camps visit our Facebook event here. AllThingsRide are passionate about bringing like-minded cyclists together for a range of UK and European sportives and events. Through All Things Ride, you can ride the best and most challenging events that Europe has to offer. From Haute Routes to Etape du Tour to The Dragon Ride, AllThingsRide have a range of events to suit all types of rider. They can tailor every trip to your needs, e.g. if you need extra nights, bike hire, insurance or a price for a non-riding partner, leave it to them. Members of Bryan Steel Cycling Club can now get 10% discount off all cycling holidays and events organised by AllThingsRide, including sportives and hospitality trips to Tour de Yorkshire, Il Lombardia and Flanders. So something for everyone, whether you want to stay in the UK or venture abroad! For details, contact Bryan on bryan@bryansteel.co.uk today. Last Friday we had a brilliant session at WattZone in Ilkeston, the new indoor performance centre featuring Watt bikes. 10 riders of mixed ages and abilities enjoyed the session in which Bryan focused on peddling efficiency and power delivery. With all the riders Bryan works with this is the first phase of developing their technique, as the rider needs the be able to deliver as much power as they can before we start building their fitness. The session lasted an hour, starting with a 15-minute warm-up, where I introduced the session and led into 6 efforts at 85% of the riders’ FTP. Throughout these efforts the riders rode at around 50RPM. For the first two efforts the rider focused on riding from their core and not pulling on the bars. During the 3rd and 4th effort as well as doing this Bryan showed the group how, by leading with their heels, the riders were able to deliver a whole pedal stroke of power instead of the normal push and pull. 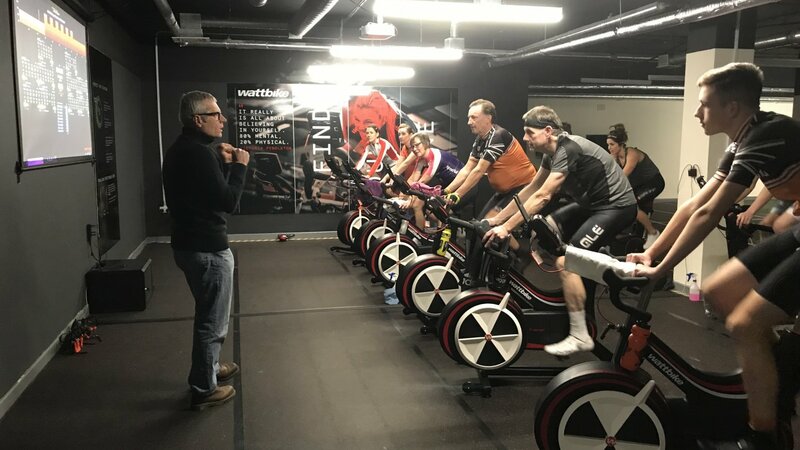 During the last two efforts we brought this together with the participants riding without their hands on the bars, but delivering the same amount of power, showing how they were able to achieve a greater speed by having an effective pedal stroke. 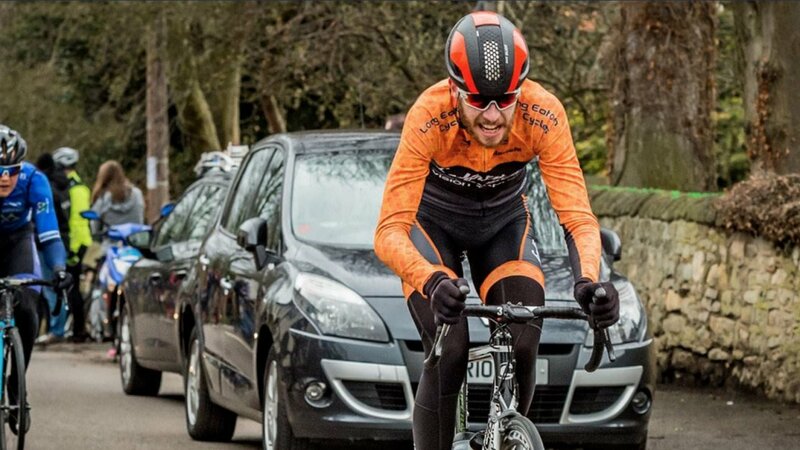 Team Captain David Ogg was just beaten into second place at today’s Upton CC’s End of Season RR after a strong showing from everyone in the team, writes Mick Padley. With Tom Booth back from Belgium the team decided to target a race that played to everyone’s ability. The course is rolling and open and in today’s wind was always going to a tough one but with Tom coming back with good legs the aim was to set him up for the sprint. For the first 30 mins of the race we had a man in every move and instigated a few ourselves but in the strong cross winds nothing was getting away. A different tactic was needed so we conserved our energy by staying in the bunch and protecting Tom from the wind with Luke Hind deployed to neutralising any attacks. However with 2 laps to go a group of 9 riders did get away and David saw his opportunity to bridge across and make it a 10 man break. With no one in the bunch willing to chase this was the decisive break and it stayed away until the final sprint. With a howling tail wind down the finish straight the sprint was fast and furious with David looking like he’d got it sewn up, but in the end he was beaten by half a wheel. The only job left to do now was to set Tom up for the bunch sprint and Sam Smith with plenty of Belgium left in his legs put him in the perfect position to dominate the bunch sprint. Chapeau to the lads who are still showing plenty of fighting spirit as the season rapidly comes to a close. 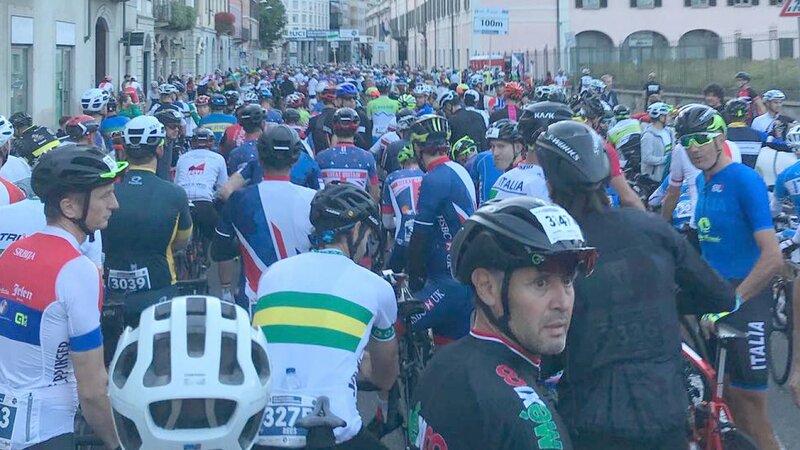 Bryan reports on his recent ride in Varese and forthcoming plans for 2019. 2018 has been a big year for us with the start of Bryan Steel Racing and the group has been focussed on getting riders ready to compete at the Grand Fondo World Championships in Varese, Italy. Through qualifying at the Tour of Cambridgeshire, myself and 4 other riders took the trip to Italy to ride with some of the best cyclists in the world. I was there for 5 days working on the Godfrey Bikewear stand who I am ambassador for and Sportive Breaks where I was the lead rider for their training rides, helping their 100 riders to be ready for the big day. I travelled out to Italy on the Wednesday and spent the Thursday looking over the 130km route. I rode over the first 40km and then the last 50km to see where any potential problems were. In the afternoon was the Time Trial where I had Jack riding and even though he was in the youngest age group he did a brilliant ride, finishing just out of the top 20. On the Thursday we had amazing weather but overnight everything changed with thunder storms which lasted until Saturday afternoon, which meant the planned lead ride on the Friday had to be cancelled and the Saturday morning ride had to be moved to the afternoon. We managed to get to ride the first 30km of the route on the Saturday afternoon but the main thing I wanted the group to ride was the first hill, which was only after 20km and was the biggest climb on the route. For me this would be the first and most important selection of the event, coming from a wide road down to narrow road where a car would have just been able to pass. So, the big day came and with a 7.50am start everyone was down early for an early breakfast before heading up to the start area with plenty of time. To see the whole 5,000 riders in their age pens was an amazing sight and as the start time approached everyone was starting to get serious. In my age pen was Simon who I coach and was good to get some good pictures together with all the other nationals riding. The start time came and we were away on time, heading out of town in a group of around 400 riders – I was trying to make my way to the front but there were two short tunnels to go through before we hit the first hill. I was in a good place but in the second tunnel which wasn’t lit someone near the front came together and stopped the whole group, and it was only when I tried to start off again that I noticed that my rear brake had been moved and I had to stop again to stop it rubbing on my wheel. It was only a few kilometres to the first hill now and even though I got back onto the first group I was at the back so I spent the hill and then most of the ride moving through the groups. I finally ran out of steam after 100km, having to sit up with cramp before having to try to push on again, but with the last 3km uphill, once I hit that the cramp came back. I crossed the line doing the ride in 3.49.50 which I was pleased with but I would have liked to get below 3.45. On the whole was pleased with my ride and Simon did an amazing ride despite his front mech stopping working and did the whole ride on the big ring (not sure how he managed this!). 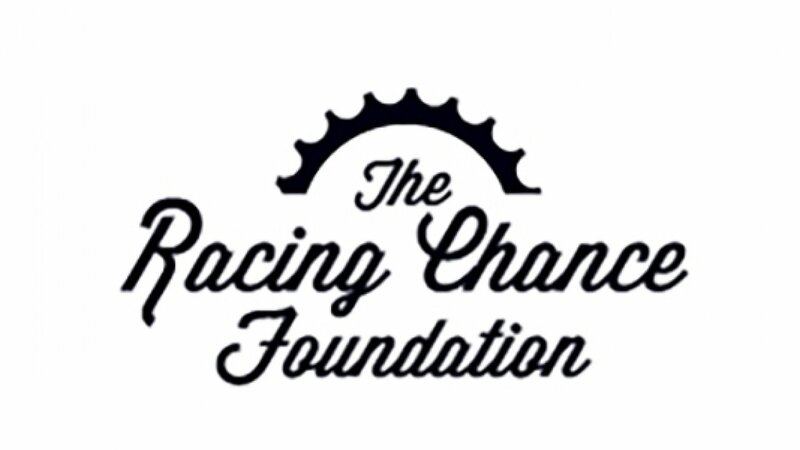 With the success of the event and working with Sportive Break over the next few weeks we will announcing the British Grand Fondo Racing Club where we would like to get people read to do their very best at 10 selected events in 2019. We will be send you some information over the coming weeks and if you would like to find out more then please send me an email to bryan@bryansteel.co.uk. As part of the teams philosophy of helping young riders we asked Sam if he wanted to ride with us whilst some of the team are away abroad. We didn’t make it easy for him by entering him in the infamous Bole Hill RR which takes in some of the toughest climbs around Smalldale and to add to the pressure we had ex winner Rowan Smart along to watch his progress and offer advice. He repaid the team in spades by competing strongly against pro riders from Vitus and Madison Genesis and taking 1st place in the Junior riders competition and 22nd overall on a day when many riders were beaten by the pace and terrain. 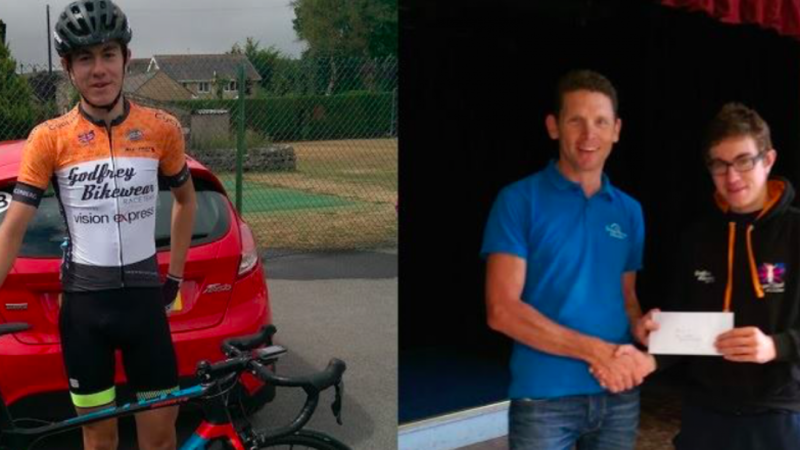 Sam will be racing with us again next week at the Holmfirth RR and we are more than happy to help him with his progress as he is on the verge of entering the senior ranks. 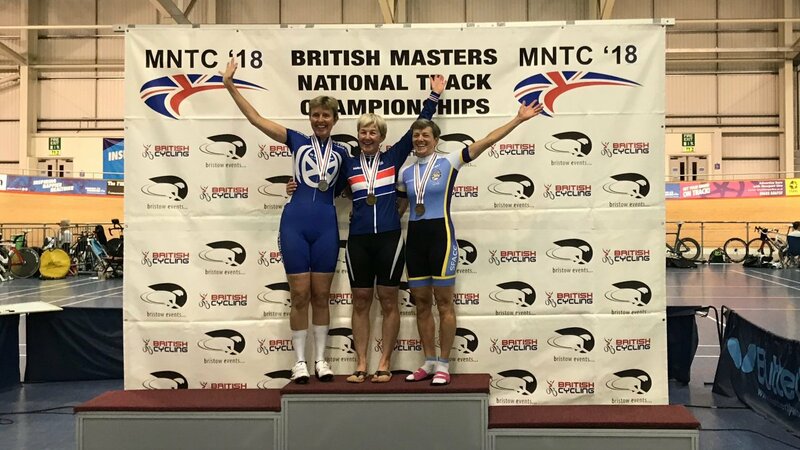 In the last weekend of June, the four riders who are part of the Bryan Steel track program travelled down to Newport in Wales to compete in the Masters track championships. Bryan reports on the successful event for his riders. The Masters events runs in the same format as the open national championships but in age groups starting at 35 and in groups of 5 years after. Within the track group we have Lindsay Clarke 55 to 59, Steve Clarke 55 to 59, Bob Barber 65 to 69 and Wayne Smith 50 to 54. With the main events ran over the weekend, the championship started on the Thursday afternoon with the 500m time trial. Bob and Wayne decided to ride this event but as their focus was on the more endurance event later in the weekend they wanted to have an effort and clear some nerves before their main focus. Both riders did personal bests finishing 5th in their age groups. Lindsay start her account for the weekend with a win in the pursuit with a personal best time of 2.40.316 which is only 1.2 seconds off the world record for her age group. On the Saturday afternoon Lindsay also won the scratch race which was hard as she was mixed with other age groups but managed to finish strong with younger riders. Sunday afternoon was the points race and as of the scratch the race was mixed with younger riders and with our season goal of winning the masters world and a current world silver medallist we decided to ride for a result in the whole race. Lindsay started well just missing the points by one place in the first 2 sprints but in the third sprint Lindsay manage to get a 3rd place and going into the fourth and final sprint Lindsay went for it and got fourth in the last sprint. This gave Lindsay the win for her age group and 5th place in the race overall. Lindsay’s husband Steve’s nationals started on the Saturday with the pursuit, just missing his personal best doing a 2.42.421. Steve just missed his timing at the start which made a slower than usual first lap but after that he was running faster than his PB, trying to make up for this slight mistake but with the pursuit only being 2km Steve didn’t have the time to make up the loss of the first lap. On the Saturday Steve also had a scratch race where Steve rode very well finishing 13th in the finish sprint. Sunday’s point race was one of the fastest races I have seen right form the first lap with Steve getting involved in the first sprint but he paid for this in the next few laps, struggling in the hot pace of the race. Steve finished in 12th place but rode very well against some very good riders. Bob is the oldest rider I work with and has focused on the sprint events in the past, but we started to work together when his goal was the more endurance events. In the pursuit he did a very good personal best finishing in 4th place in a time of 2.46.060. In the scratch Bob rode very well following all the moves and going into the last lap he was sitting 3rd place but with half a lap to go his legs started to go, finishing in a very close 6th place. For the points race and with his new focus we decided for Bob to look to be in the break instead of waiting for the sprint and going on the attack twice and in the first of these getting half a lap lead before being brought back just before the second sprint. He finished in 8th place which didn’t reflect his ride at all. Last we had Wayne riding the 50 to 54 age group where he did a flying ride in the pursuit recording a nearly 5 second personal best of 2.24.455 and only missing out of a medal by 0.250 of a second. In the scratch Wayne finished in 9th place being very active throughout the race but I think doing such a hard ride in the morning affected this result. Like the other points races Wayne’s was the same with being very fast with him winning the first sprint but others went straight on the attack after this sprint not giving him any time to recover and affected him for the rest of the race getting 6th by the end. Overall is was a very good weekend for the Bryan Steel Track group with every rider apart from Wayne going to the World Championships in September and this weekend was more a run out with their main goal being the worlds. Everything is looking good for September and hopefully a good haul of medals. If you are interested to hear about the Bryan Steel Track group programme or another of the programmes we run at Bryan Steel Cycling, please visit www.bryansteel.co.uk or contact me at bryan@bryansteel.co.uk to find out more. If you would like to subscribe to our monthly newsletter, please contact me. IT’S BEEN LIKE CRIMBO UP IN PIMBO! We took a team of 3 riders to the Racing Chance Foundation Nat B race at Pimbo today, organised by Fred Bamford and his team and everyone came away in the points. The way that David, George and Tom raced today is an example of how you can help people develop when you create the right environment for them to pursue their aims and understand the value of working as a team. The 65 mile race on one way roads helped the riders compete in a safe environment without the worry of oncoming vehicles, probably making it the next best thing to closed roads. After the first couple of laps some tentative attacks went off the front which with the experience they have gained the lads knew were not worth chasing. In the first third of the race both David and George shook the pack up to test who were the riders with legs that could be dangerous in the final. Meanwhile Tom’s job for the day was to sit tight in the bunch and capitalise on any damage that his team mates could create. With 10 laps to go George found himself in a soft break of 5 riders which soon developed into a 20 sec lead. Five other riders recognised the danger after George’s recent form in the OVB stage race and started to bridge across. David ever alert knew all he had to do was follow them and if they bridged he was in the perfect position and after a lap a group of 11 riders now formed creating the winning break. George and David continued to drive the break with the lead stretching out to 30 sec leaving it all to the sprint, which was a close affair with David taking 6th and George 11th. Meanwhile the rest of the field had split apart and Tom positioned himself in a small group off the front of the bunch. Tom recognising that points were still available knew he had to win his bunch sprint and with 50m to go jumped his companions to take a very comfortable 12th. One thing you can say about George this year has that he has been consistent; consistent in his approach to racing; consistent in supporting his team mates; consistent in bringing back the breaks and leading his colleagues out for the sprint and it was this consistency that allowed him to deliver 5th on GC in the OVB 2 day stage race this weekend. Day 1 started with a TTT and with George being the engine in the team we finished in a good 3rd place leading into stage 2. Stage 2 consisted of a road race around the Harby circuit and the team set out to consolidate their position. David Ogg the lightweight in the team put the pressure on every time up Harby Hill and himself and George finished the day 3 seconds off the GC. On day 2 we had two cards to play: Sam and Tom were between 20 and 30 seconds off GC and so for them to succeed they had to be aggressive and force a break, whilst George and David could sit back and and wait for developments. Tom forced a move coming into the head wind along Long Lane with Sam bridging across to join him. They then drove the break hard causing alarm bells in the peleton. A number of riders chased the break down and then they just sat in rather than capitalise on the break allowing the peleton to close the gap. With two laps to go this was the signal for George to go into “Derny” mode and he dragged around 10 riders away with him and that was the definitive move in the race as they held a minute over the peleton. Climbing is not George’s strongest point but he held on up Harby Hill to finish 7th keeping him in contention. The final stage consisted of a 2.5m individual TT and George was only a few seconds off the podium. He set off at a strong pace and was up on his rivals as he passed in front of Belvoir Castle but the effort used to in the road race cost him seconds in the final rise to the finish and he finished in a very creditable 5th place. Bryan Steel Racing went on mass to the Tour of Cambridge to see how many riders we could qualify for the Amateur Road Racing Worlds Championships, aka Grand Fondo World finals in Italy later this year. 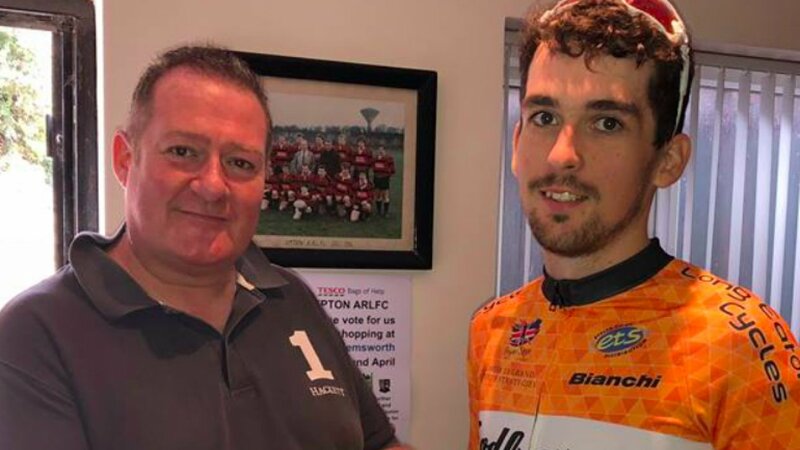 All the riders doing this event are members of the Bryan Steel Racing team https://bryansteel.co.uk/advance/#raceteam and team manager Bryan Steel reports on the eventful weekend. The Chrono on the Saturday started well with 3 of the team riding in their age groups. In the youngest age group, we had Jack who went to France last year, and with a stinking cold he still manged to get qualification – seeing him at the end I would still wanted to have been following him. Ian was in the 60-65 category and managed to finish in the worst position of 4th in his age group. He is already planning where we can make up 10 second for 2019. Simon Inman was our third rider, who didn’t have the best ride with his mind being focused on Sundays Grand Fondo and his first time doing this event but gained some valuable experience for next year. The main focus was Sunday’s 78 miles across the Fenland in the Grand Fondo and in the morning we were very happy to see that there was no wind unlike last year. With most Sportives staring very early in the morning it felt very strange to be starting at mid-day, but as the package with Bryan Steel Racing included access to the Club Kermesse VIP facilities we were able to take full advantage of the hospitality on offer. For this year all the Bryan Steel Racing riders was in the race pens, albeit split into our respective age groups. Brook Pitchford was the first to go in 35-40 group but as soon as he went myself, Simon, Lee and Martin were taken to the start line with the other 196 riders. For me the was like old times when I used to race in big races but for the other riders it can be a daunting experience with so many other competitors, and as we started the goal was for me to keep them out of trouble. This was OK for the first 10km but then once we moved onto narrow lanes and even with the roads closed to other motorists was hard to keep in the right place all the time. The riders were going very well but after an hour we hit the rough roads of the Fens. Along with the twisting and turning nature of the route the riders were starting to find it hard to be in the right place in the group and the race started to break up with the pressure of the riders on the front. I was in my element like old times and even had the chance to catch up with some old racing mates before we hit the last 20km where things got serious. My first priority was to qualify for the World Championships and stay safe but as we got near to the finish I was finding I was able to hold the right line, going into the last corner in around 10th place… until an untimely crash caused me to swerve off my line and kill my speed. I ended the race in 27th place. Once through the finish I found Brook who had done a brilliant ride, finishing in the front of his group. Simon was the next through, also finishing within the time limit. Martin Pearcy was the next of our team to finish, just outside the qualification time due to a puncture out on the route. He lost 6 minutes changing his inner tube (amazing time) and missed the limit by 4 minutes. Next in was Lee who had struggled after getting caught up behind several crashes but I also think the hot weather had got to him which didn’t help. Of the older riders, Paul Newson achieved a massive personal best, but just missed the qualification time in his 50-55 age group. Last but not least was Steve Wright, who was in the 60-65 age group, however he was somewhat at a disadvantage as his group had to wait until all the sportive riders had left before his group started. Steve hasn’t done anything like this before but did a great job finishing just outside his time limit. All in all, we had a good weekend with 5 riders able to book their place in Italy in September. If you are interested to hear about the Bryan Steel racing team programme or another of the programmes we run at Bryan Steel Cycling, please visit www.bryansteel.co.uk or contact me at bryan@bryansteel.co.uk to find out more.